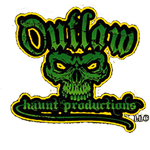 Outlaw Haunt Productions offers premiere custom masks, costumes, and props for your haunted attraction. A company built from many years of haunt experience, we aim to provide the highest quality haunt products that will contribute to any haunt atmosphere. All of our masks and props are manufactured with the very best materials right here in the United States.